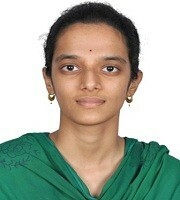 Ms Challa Sushmita is a Bachelors student in the Department of Electronics and Communication Engineering, Dr. L.B. college of Engineering for Women, Visakhapatnam, India. She also pursued Diploma in Music from the School of Distance Education, Andhra University. She received the upcoming artist award in playing veena. She is an active member of the PoemHunter.com, The World’s Poetry Archive. She put forth many paper presentations and participated in many elocution and debate competitions.